Street and Parking Lot Available. We are centrally located off Hwy. 101 in San Rafael, across for the famous Frank Lloyd Wright Marin Civic Center. La Toscana is a family owned and operated Italian restaurant and bar located in Marin County. It was established in 1985 by Paolo Mori, his wife, Marilyn, and Michele Quilici. The owners all grew up in Lucca, Italy and immigrated to the U.S. in the late 1950s. They wanted to create an atmosphere that reminded them of home – a place where locals would gather to eat, meet friends and family and celebrate with food and wine as every Italian family does. Chef and co— owner Giovanni Racanello joined La Toscana in 1986. Paolo and Marilyn’s daughter, Laura Mori Riella, and youngest son, Michael Mori, joined the La Toscana team in 1992 and 2002, respectively. Paolo loved to make people feel welcome and, just like all the Moris, enjoyed his food and wine and loved to see others do the same. This is the proud tradition that La Toscana carries on. Available Tuesday thru Friday 3‐6pm bar, bar tables, patio only. Salami, coppa, sopressata, mozzarella fresca, olives, crostini. Risotto balls, prosciutto di parma, peas, mozzarella, tomato. Tomato, basil, garlic, evoo, parmigiano. Vodka, cranberry, fresh lime, triple sec. Citrus vodka, sour, triple sec, sugared rim. Had not eaten there for a few years. Pleasantly surprised that the quality of the luncheon food and service was terrific. The mussels and clams in a delicious broth were wonderful, as was they Frito Misto with a pleasant mixture of artichoke hearts, shrimp and Calamari, accompanied by a tasty aioli. My guest enjoyed his fresh greens salad which was seasoned perfectly. The daily special was a ravioli dish with a white sauce that he thoroughly enjoyed. Service was outstanding, ensuring ample french bread, water and beverages. Will return for dinner. Delicious! Staff were all super friendly and helpful. It was loud when we first arrived, but we didn’t let that get in our way. Will definitely be back! The service was efficient / good, but the food was below average. I had an arugula salad that was nice enough (hard to go wrong) but my main dish -- a sole piccata had too much of the sauce and the sauce was flavorless, which I've never experienced with a piccata sauce before. The broccoli side was also overcooked. Just kind of a "meh" experience from a taste perspective. Wouldn't go back. La Toscana is our “go to” Italian restaurant. Food is always excellent. I usually get a pasta dish. This time, for the first time, I got chicken Marsala with polenta and veggies. It was fabulous. My new favorite! It's been a while since we've been there as the last couple of times, we couldn't get in when we tried - waited too long to make a reservation. We were very pleased with the "new" decor. It is very nice and much more open looking and lighter. The food was very good, except the vegetables were overcooked for us. We had the osso buco, short ribs, chicken parmesan and cannelloni. All of them were quite good and as expected. We had several salads and they were all delicious, but we really wish that restaurants, in general, would move away from the giant salads they have all gone to and back to a smaller, side salad. We were first times diners at La Toscana but we will go back again! Out of town guests lived it. Always excellent food. Portion sizes for osso buco seem to be shrinking though. Tables too close together for twosomes. So we just make friends with our neighbors. Definitely something you do not want to do if it’s a romantic night out. The Bar lounge room is much more boisterous if you are going out with office buddies or a group of friends. Their executive chef is the key to their success. We continually to enjoy our dinners at La Toscana prior to performances at the Civic Center. Our waiter on Monday was particularly good. He was very responsive and unobtrusive. 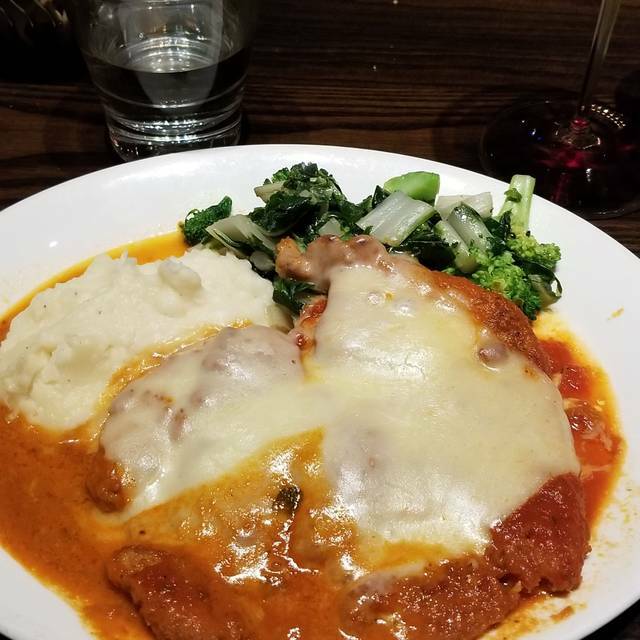 La Toscana is always delicious! And they were amazingly accommodating, even with my big group who had to be super late to the reservation because my car broke down. Highly recommend the Cacio e pepe! This is a great place for a family visit. We had parents, grandparents, and two kids under the age of three. It was crowded, hectic, and entertaining. The food was good, and there was plenty for leftovers. We started with bread (a lot of bread), bruschetta, and burrata. Plenty to share. A couple of us got the cannelloni: it was steaming hot, smelled great, and tasted good. A couple of others got the puttanesca and also enjoyed it. One of us wanted to eat "light," so he went with the shrimp louie. And the last order was a fish special that was enjoyed. The kid's tortellini is probably enough for an adult, though it is just in marinara sauce. We also got our older son his first Shirley Temple, and he helped out with the birthday creme brulee. He will probably want to visit again. There were families all over the place. We don't visit restaurants much with the kids, so this was a good place to go. They both behaved well until dinner went past their bedtime, so we got out before they turned into pumpkins. La Toscana is our "go to" restaurant for birthday dinners and other celebrations. The food is always marvelous as is the service. The dining room can be a bit noisy but that isn't the fault of the restaurant! This restaurant is always on point. Service is great, authentic Italian food is very, very good, and on Wednesday's they offer half price wine. The food portions are quite big and the value for the price is off the charts. This has become our favorite Marin County restaurant for the family. Never had a bad experience here. Keep up the great work, La Toscana! This is a great place. Although we had a reservation, to avoid waiting, we agreed to be seated in the bar. The ambiance is simply not the same. Absolutely. Was going there before Symphony. We were a party of ten. The waiter took care of all of us with a smile, suggested some good ideas, and got us out in plenty of time. 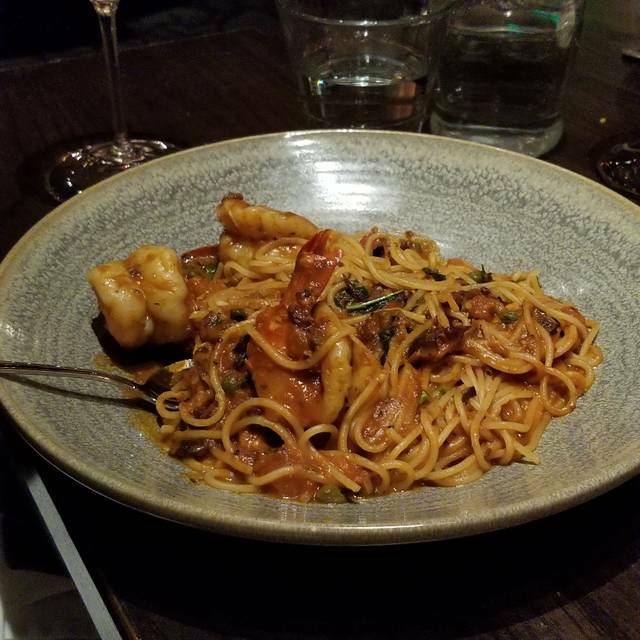 Eggplant and Seafood Pasta were very good. We ate in the bar area and it got noisy when it got packed @5+. Half price wine is a very nice perk. Once we got a server the service was good. La Toscana is a long tie favorite "go-to". The food is always amazing and the staff is helpful and very efficient. They have a great happy hour and hands down the best spaghetti and meatballs in the county. Sometimes the noise level is deafening and I go there often. Dinner last night was really good -- just right. And, the service also was excellent. Great menu with lots of choices among Italian classic dishes. All the pasta dishes are superb. Prices are reasonable and the service is outstanding. When the dining room is full, it's pretty noisy because everyone is having such a good time and a good meal. We went to La Toscana for a lunch and got a nice booth at the back. The server, Linda, was very experienced and very helpful with the wine and food choices. We both liked her immediately. The food was well prepared and presented in an attractive way, and tasted great. She had salmon, I had meatballs with spaghetti, you can tell a lot about a restaurant by the way they prepare old standards. If Michelangelo opened up a restaurant, the food have been his masterpiece of art. Delicious food, great ambiance - and exceptional service. We often go here for birthday celebrations! Food is delicious and authentic and the people are wonderful! Caught up with some old friends and had plenty of time to chat. Food was fine and service was very good too. Love this restaurant and the family that owns it. Great staff. We were there on Friday night. It was packed and the noise level in the dining area was louder than I would have liked. However, the food and dining experience was still great! I would have appreciated seeing the menu that was for that night. Our waiter, Joe, was very cocky and when we asked where the balsamic glaze was on top of the tomatoes and bruschetta and soft burata cheese, first he said it had slipped to the bottom, but when we stirred it up to look, it was not there, but he said it was there. We called him over later to bring us some on the side so we could put it on the tomatoes as it is what makes this dish so wonderful as a shared appetizer. He came back with a bowl of Balsamic vinegar, not the glaze, which is thick and sticky. We told him no, this is not what we asked for, the glaze is not watery at all. Then he left and never came back until check time. It took two requests for him to wipe off the oil and butter from the table so we could put down the dessert menus and enjoy the rest of our meal. After we had paid he came over and said, by the way, the glaze tonight was watery. It was total BS! He kind of ruined our lovely dinner. If he doesn't know what he is serving or how a dish is supposed to look, he should ask or be trained before lying to customers because he was unclear on the components and didn't want to deal with it! Excellent food and ambiance. Our waitress, Linda, was outstanding.